You don't have to sacrifice flavor when it comes to preparing seafood in a healthy way. Whether it's grilling, steaming or roasting, everything from shrimp to sea bass can become a satisfying, diet-friendly dinner. 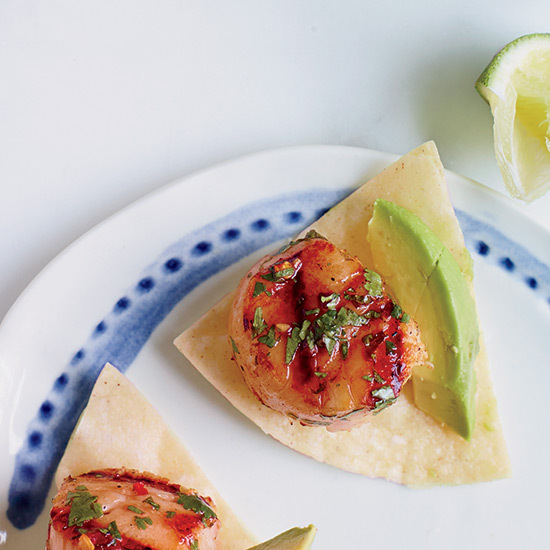 Here, our best healthy seafood recipes. Rose wine in the sauce and the salad dressing is the secret ingredient in chef Jennifer Carroll's delicious grilled swordfish. 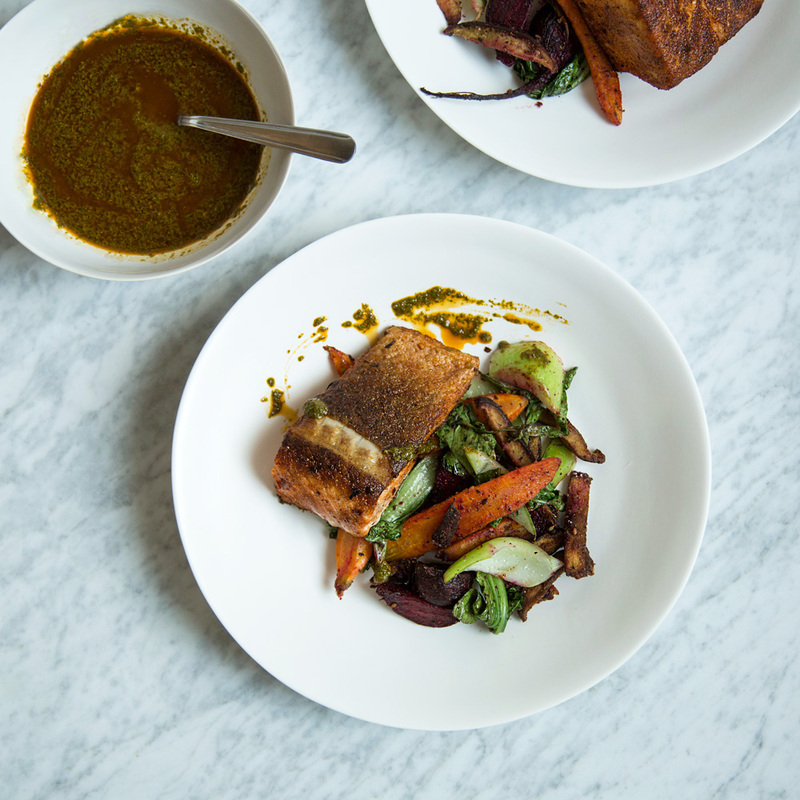 Chef Jared Wentworth of Chicago's Longman & Eagle looks to fresh spices such as cumin and coriander to bring fabulous flavor to healthy dishes like the crisp salmon and vegetables here. 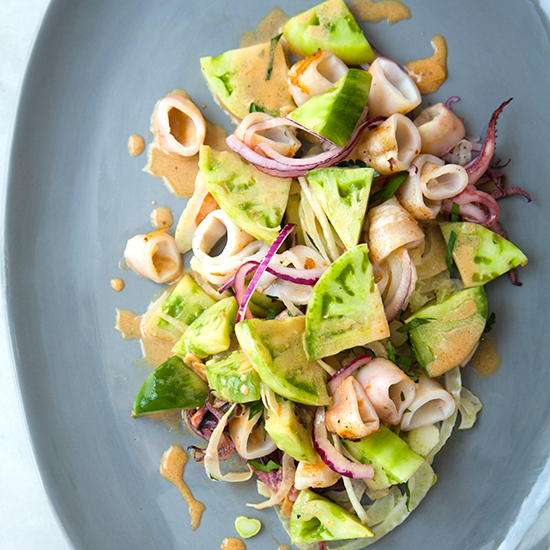 Grilled squid and green tomatoes are paired together in this wonderful, flavorful salad, which gets a final addition of a fantastic sesame-lime dressing. The crisp, buttery skin-on salmon fillet in this healthy dish from Food & Wine's Justin Chapple is perfect with the tangy lentil salad, but the salad itself is so good, it could easily stand on its own. If you can't find frisee, use escarole and chicory instead. 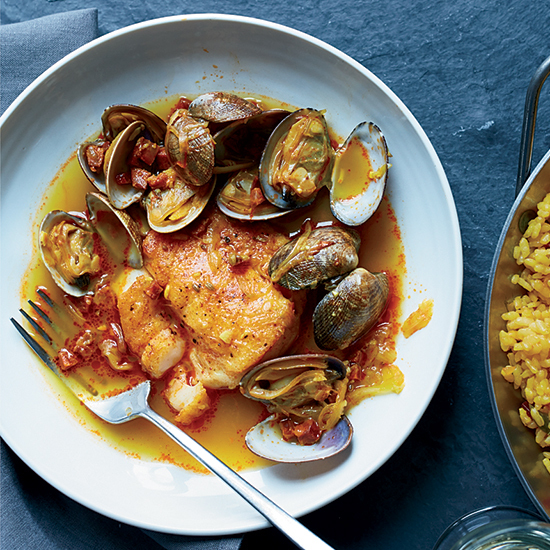 In this easy and light Spanish seafood stew, chorizo, fennel seeds and a pinch of saffron turn a simple chicken stock into an intensely flavored broth in just 15 minutes. 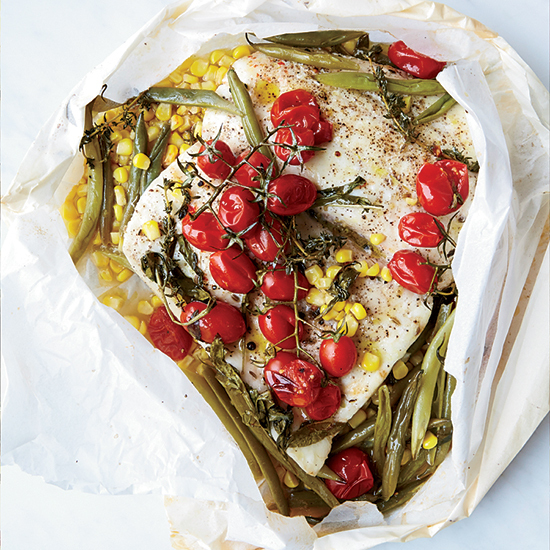 Chef Kristen Kish keeps it simple by roasting halibut, corn, tomatoes and green beans all in one simple packet, allowing the flavors to merge into one delicious meal. No bowls, boards or even knives are required for this recipe. 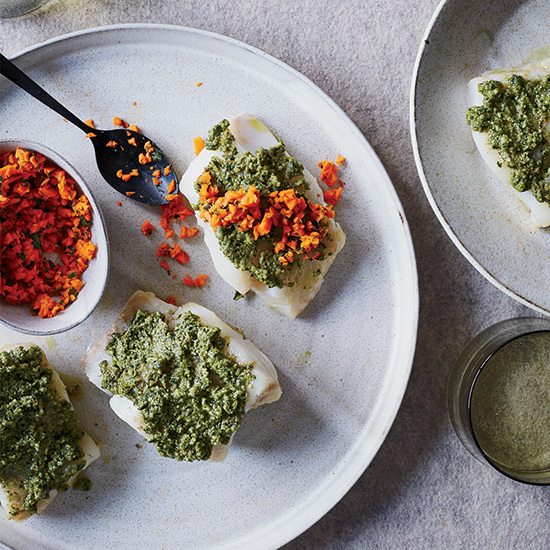 While chef Renee Erickson of Boat Street Cafe in Seattle roasts salmon fillets, she prepares her vibrant basil sauce entirely in a blender--she even makes extra to drizzle over canned sardines for lunch the next day. Chef Mourad Lahlou of Aziza in San Francisco performs pantry alchemy to create this elegant dish. To complement his spicy Sriracha mayo-marinated shrimp, he serves a cooling puree of canned chickpeas, tahini and lebneh (a thick, strained yogurt cheese, available at Middle Eastern markets). For a quick cheat, you can use store-bought hummus and mix in Greek yogurt. 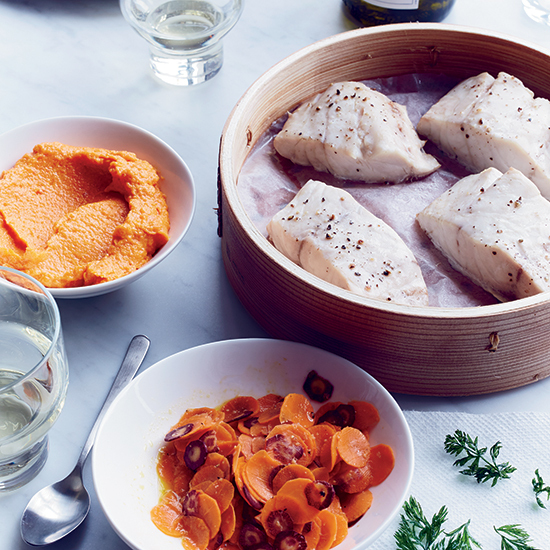 For this bright and delicate dish, the carrots that accompany the fish are pureed until silky, and also sliced into thin strips and marinated. The tops are frizzled and served as a garnish on the fish. Tom Colicchio was inspired by the smoky flavors of Mexico while filming season 12 of Top Chef. He incorporated many of those elements into the menu at his new restaurant, Beachcraft, at the 1 Hotel in Miami Beach. 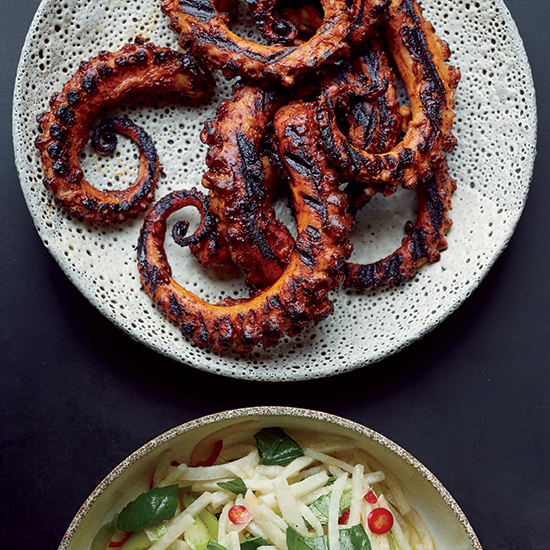 In this dish, the octopus is first braised in sherry and then the skin is removed to make it extra-tender before it's finished on the grill and glazed with a tangy ancho chile sauce. Edward Lee, chef at 610 Magnolia in Louisville, Kentucky, is an Asian-flavor investigator: He seeks out different Asian cuisines to inspire his own recipes, like this quick and fiery Thai-inspired curry served over a bowl of shredded greens. "The crisp freshness is delicious with the richness of the curry," he says. For even more crunch, Lee adds roasted cashews. Quatrano uses black bass, which she loves for its flaky texture, but snapper, branzino or small cod would also work well in this dish. She simmers the fillets in a broth scented with fresh thyme, fennel and orange zest, then drizzles thick, garlicky aioli on top. Marcona almonds make a rich, nutty and unconventional romesco sauce for these cast-iron-skillet scallops. 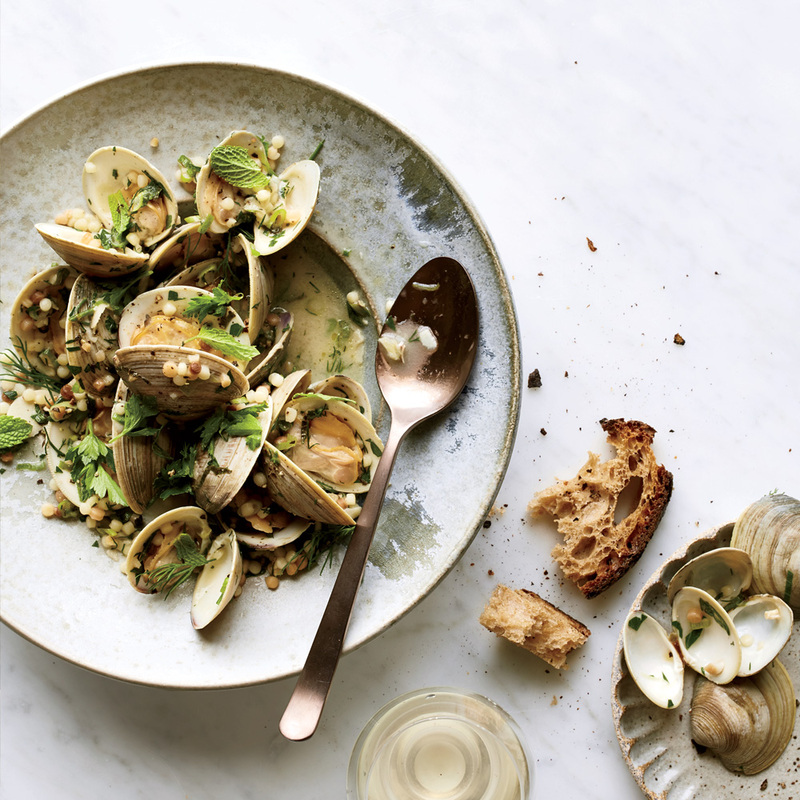 Serve them with a citrusy Sauvignon Blanc. Chef Ana Sortun tops hake with a rich, spicy sauce inspired by the iconic Lebanese tarator sauce. The fresh, ground carrot "tabbouleh" served alongside adds more bright flavor. For snapper fillets with perfectly crisp skin, chef Jennifer Carroll only seasons the flesh side before laying the fish on a very hot grill.